I enjoyed the majority of the course. I felt a small portion of it could have been eliminated due to it being common knowledge. I love this program! Literally changed my point-of-view of coaching from the first module! Very inspirational. Gave a lot of perspective and different approaches to try to reach athletes of all types. The modules and course material really give you and understanding and idea of how to progress further into your career as a coach. The impact this course has made on how I will approach coaching as well as life is immense. I am very happy that I have had the chance to take this course. This course was extremely eye-opening. It has transformed my coaching outlook. I found this course very helpful, informational, and inspirational. 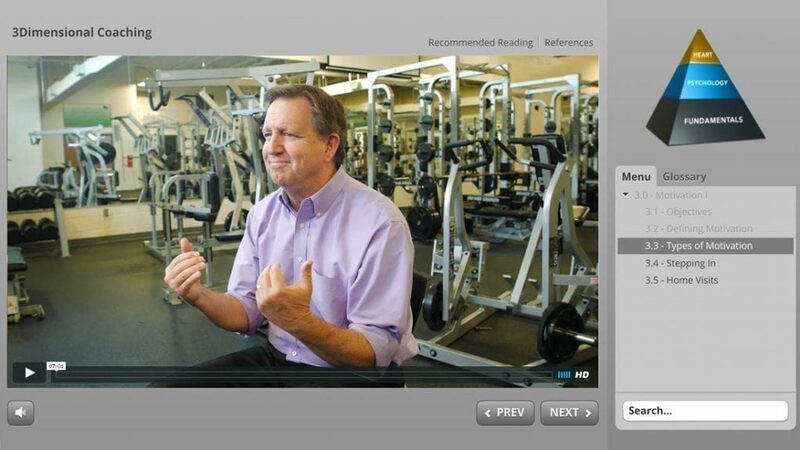 I enjoyed this course because it seemed very relevant to high school sports specifically. I appreciated that it did not only focus on football (or other more popular sports.) I wish there was a female coach that had a segment. This was a good practical course. The reflection and implementation parts are very useful. 3D coaching a is great resource to have in your toolbox. This teaching has allowed me to rethink on how I want to be remembered as a coach and how I should connect with my athletes outside of just the fundamentals of the sport. This course was awesome and opened up my eyes to a new way of coaching! It was a great way to give insight into my coaching style. Great information and good stories to enhance information. Great information and thought went into the making of this course. It can help coaches of all ages and years of experience. I wish I had been able to take this course earlier in my coaching career. This was an excellent course. I cannot wait for the next season to begin so I can start instilling the values of a 3D coach onto the players. Overall, great course. At times, I felt answers could be based on opinions of instructors of the course rather than facts. Aside from that, thoroughly enjoyed course. Throughout my coaching career I have been viewed by others as being a successful coach, however my own assessment of the 'feeling(s)' at the end of the season have left me in discontent. Hopefully the ideals and content provided by this course will enable me to tie loose ends, and solidify my purpose as a coach. Because of my age I am nearing the end of my career, and wish I would have had this course many years ago, but I can implement things now....and plan to pass this content on to my children who have become coaches or leaders in their own realms. Thank you! Excellent program for coaches of all levels and sports! Great ideas, just maybe condense things and videos into shorter segments. I felt like a lot of the time one of the presenters would say something, I would think that what they said was a good idea, and then they would spend 5 minutes saying the same thing over and over in different ways. I appreciated the way the course helped me think about my coaching philosophy. I thoroughly enjoyed 3D coaching. It validated my thoughts on teaching more than just the fundamentals of the sport. It teaches coaches how to improve the whole person, not just the athlete. This course has helped me in 2 areas: 1. Solidify my purpose and remind me of why I coach. 2. Establish a concise framework to execute our plan for the program each season. Lot of great material in this course. The course will make you evaluate your own coaching procedures. Whether you would use the concepts or not, it really make you access, evaluate your coaching style. I thought it was amazing. I have a completely different view of coaching after taking this course. I also feel I took it at a perfect time because while taking it I read Coach Duke's book "3D Coach" which went hand in hand with this course. This course was very helpful and full of good information. Recommend this course if you want to really start believing in yourself and find the success and reasoning to become a better coach and person. A great course that allows us to look internally for new ways to promote positivity in our activity. Although it was time consuming, there were a lot of good ideas that I was able to take away from this course. They covered a lot of information that I don't often think about myself, and did a great job explaining where today's kids come from and how to reach them. While I find myself using many of the strategies they gave, I still found numerous changes I can make to make both myself and our program better. 3D coaching is so eye opening to the intricate world of coaching. It's a great responsibility to coach today's youth, this course is a wonderful support system for that. This is an excellent course that I have greatly benefitted from! Fantastic and it helped me become certified in a field I am passionate about. This was an amazing journey. I can't wait to start implementing this knowledge into my program. I loved it. Showed me a variety of methods to become not just a better coach or teacher but as a person. Information was detailed perfectly while being easy to understand. This program has provided me with the tools to move forward in as a fully capable, competent and inspired 3Dimensional Coach. To be honest, many of the foundations of 3D Coaching are already in my heart. I have always coached to the hearts and to the minds of my players. However, I would not in any way have considered myself an expert within the Level 2 and Level 3 realms of coaching. I knew I wanted to coach this way. I knew I had to coach this way. I even know why I wanted to coach this way. I did not know exactly how to coach this way, though. The strategies provided through 3Dimension Coaching will benefit my girls basketball players in ways I can't even imagine. The strategies will not only make me better as a coach, but also as a person. This program should be mandatory for any coach, for any person responsible with coaching and caring for players. Thank you so, so much for this opportunity. My life, and most importantly my players' lives, will be changed forever by this! This course is designed for the experienced coach. It offers many suggestions that go beyond surface coaching. This course didn't necessarily teach me new information, but rather it allowed me to reflect on my teaching and coaching so I can improve my practice. It hit all the elements of coaching in today's world and look at things in a deep spiritual sense that is far different than any training I received. I think that is why we coach and teach. It was awesome. I really found this course to be very good information for ANY level of coach with ANY level of experience. This course provided great information, suggestions, and reminders for coaches. I thoroughly enjoyed it. 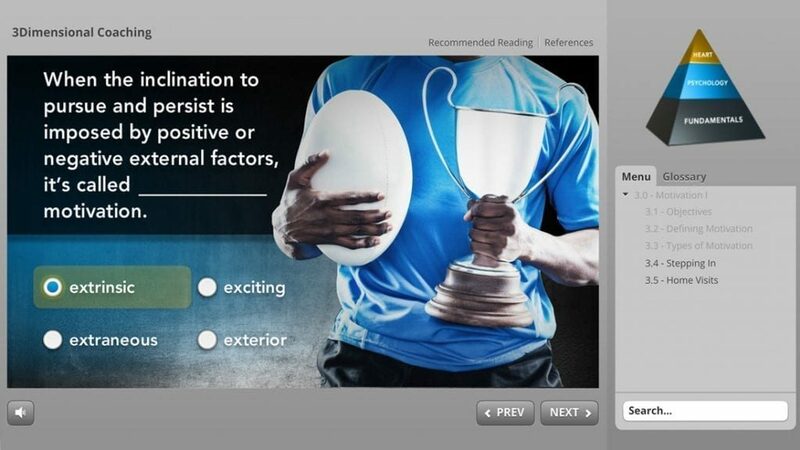 Thank you for developing this tool to help improve the experience for players of all sports. The 3D course is outstanding and inspiring. I see application for coaching any sport. It enables coaches to use their influence in way that is God honoring. This course was very enlightening to things I have been doing wrong and things I can improve on to better serve the young athletes that I coach and the community we belong to. I just wish I would have gone through this sooner! Thank you! 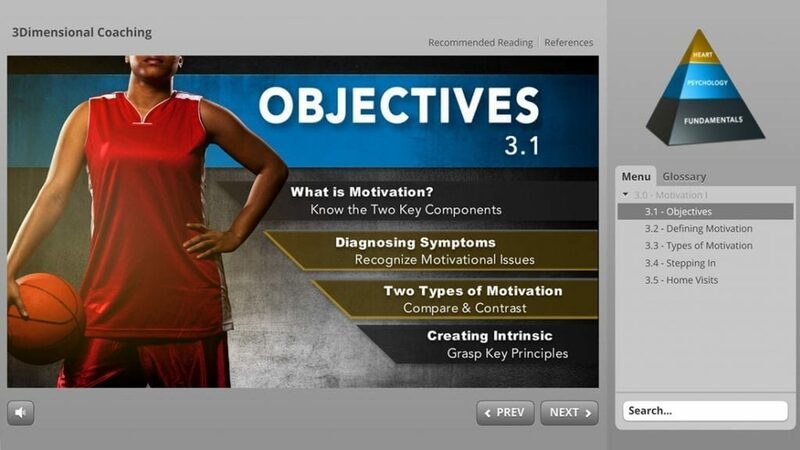 This course had very knowledgeable ideas for my student-athletes that I hope to use in becoming a better coach. The content was excellent and I really enjoyed the way it was presented by all speakers. It reinforced a lot of beliefs I already had and cultivated a number of new points of view. Overall, it was good. Many of the ideas we have in place already but it was a good reminder to continue doing them and improve them/build more into our programs. This couse was very beneficial as a teacher and coach. It helped me gain new insight into the true meaning of sports and how powerful a teacher/coach can be in the lives of those they teach/coach. This course was beneficial in allowing me to professionally develop my coaching knowledge and skills. This course is great. It helps open your mind to new ideas and puts purpose behind your actions. The framework that 3D Coaching has provided is a game changer; Connectivity is the key to legacy coaching and the 3D framework is all about ways by which to improve the connectivity between coaches, players, parents and administrators. I learned lots of great ideas to implement and it also confirmed a lot of my beliefs as a young new coach on how coaches should operate and run their team. More coaches need to go through this program to help establish a better team culture. 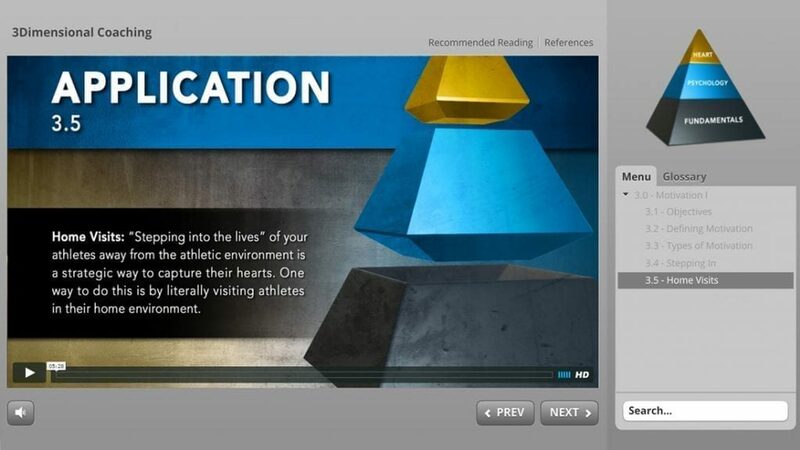 I would definitely recommend this course for any coach or athletic director. Great ideas and lots of great information. It teaches coaches how to coach in order to be intentional and not just coach at random. I loved it! This course came to me just at the right time in my life-thank you GOD! 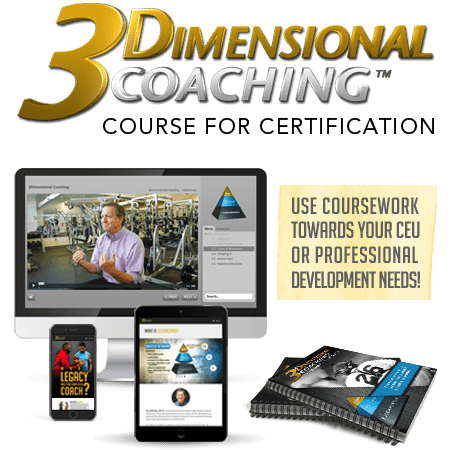 Any coach who will take the time to seriously view, reflect upon, and then discuss the content of the 3D Coaching Certification course will experience a life changing framework from which to learn, lead, and leave a legacy. 3D Certification should be a requirement for all organizations that believe coaches can make a significant difference in the lives of our young people and in the leadership of our communities. I really enjoyed this course and I am excited to implement what I have learned. This course opened my eyes to things I was experiencing but not realizing. Overall, I liked the course a lot and am looking forward to starting the lessons and actions with my players. A great motivational tool for improving relationships both on and off the field. I liked the course! The videos were long! But the information was great. I felt that this course offered easily digestible tidbits of sports psychology while also reaching a deeper level of the soul that most programs will not teach you. I loved hearing strategies that I intend to implement into my own program, and the examples that were given. Excellent course. Although I have been in education for forty years, I learned many new things particularly about dealing with our current generation of young people. I also learned many things that will be helpful in my own life. For the most part, the course was interesting and stimulating. The specific examples of methods to reach 2nd and 3rd dimension coaching were quite good, and I believe well worth incorporating into the coaching environment. The course was very insightful. It makes you take a hard look at yourself and your purpose. It offers great suggestions on how to improve yourself so that you can have an even greater positive impact on the people around you. 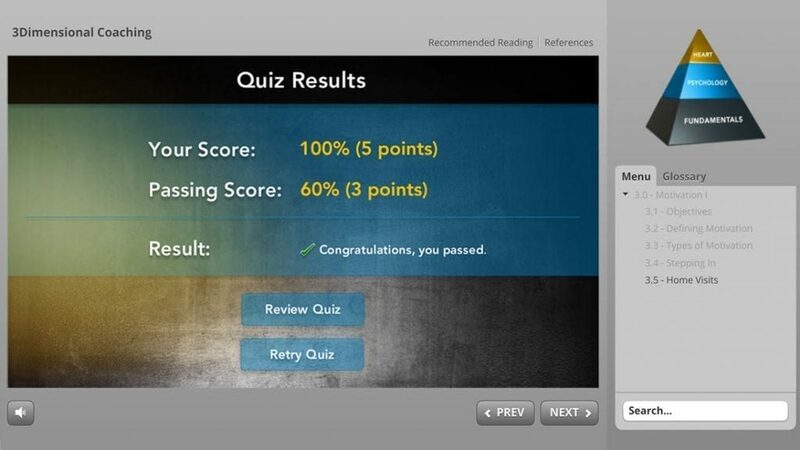 Second time taking this course and it is better than the last version which I thought was impossible. I implemented these strategies since learning them. They are not really things we all don´t know. Even more than that these are things that we as adults want but we forget, often, that the children we are charged with raising in our communities need these strategies more than we do. I am a firm believer in the power of serving others thanks in large part to this framework that puts what we already should know into a process we can use to better all those around us. A good reminder on how to do things the right way. 3. To realize that altough certain aspects can be part of more than one dimension, mostly coaches try to solve a problem of one dimension, with the tool of another dimension, mostly 1st dimension. Loved how there was not any wasted time. Every part of the training was filled with great content that captured my attention. Excellent course, very helpful and has a variety of options to assist in the development of a insightful coach and community. A VERY good course that I would recommend to any coach out their that is stuck in a slump or that is having a hard time thinking of new "out of the box" ideas. The 3D Coaching framework does a great job of generating true reflection for the coach. It is very inspirational and goes the extra step of aiding you in creating a plan, complete with mentors, mentees, and accountability partners to make sure you follow through on the plan you've created throughout the framework. I can't wait for our kids and our coaches to benefit from this! I have not only been a pastor for more than two decades, I have coached football for 28 years. This training is by far and away the best tool I've ever been exposed to. It is a culture changer. I feel that this course was exceptionally presented and challenged me to not only become a better, more compassionate coach but more importantly, to become a better person. Thank you! Course has great meaning. The more I advanced the more I knew it was worth my time. There was very insightful material that made me sit back and think about things I can do different and how I can improve my coaching profession. This is the best coaching program that I have ever been a part of. I can't wait to utilize this information with the BBCHS Volleyball Program. Absolutely loved this course. Changed the way I view my coaching abilities and strengthened my leadership. Enjoyed going through the course. Enjoyed the real life examples for the 2nd and 3rd tier coaching. If you are looking for advice on how to build relationships on your team; this is a great course. If you're looking to become a transformational coach, someone that impacts the lives of the children you interact with, this is the best source available. Become a better coach, leader, and person. The course was great and an excellent reminder of what is important! I thought that was a great coaching program. I did a lot of what was mentioned before I learned about it, so it was nice to see some validation for my coaching philosophy. Love seeing the faith tied in as well. A must course that every aspiring coach, veteran coach, parents and community should take, there's so much more that goes into sports and we sometimes lose perspective. I highly recommend it!!!!! I like the depth of this course. It really takes connecting to your athlete's and their mental/emotional needs to the next level. Something all coaching need to hear and reflect on. Fantastic information to help with today's youth. Nice reflection course for all coaches regardless of experience. If a student wants to receive college credit for taking 3Dimensional Coaching, he/she must enroll in that version of the course. The cost is $550 for 3 hours of transcripted college credit (graduate level), whereas the cost is only $125 to take the course for certification. The course for college credit has an additional unit utilizing Joe Ehrmann’s book InSideOut Coaching, while the course for certification does not include this extra work.